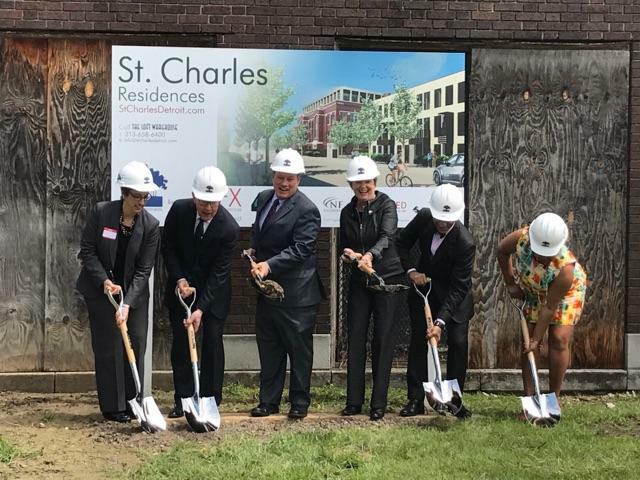 St. Charles, a former Catholic school in Detroit’s Islandview neighborhood, is currently being developed into 25 condominium units, and a new 10-unit apartment building is being development next to the school. NFE provided professional land surveying and civil engineering services for this condominium/ apartment project. The work comprised of boundary, topographic and as-builts surveys; site plan development; construction documents; and landscape plans. An additional floor on top of the three-story, century-old school will be added for the school to be developed into 25 luxury condominiums with high ceilings, an open concept design and secured outdoor space. The three-story, 10-unit apartment building will be next to the former school in the empty lots where homes used to be. Construction begin on both projects in the summer of 2017, and will end in the spring of 2018. NFE is proud to have been part of this residential development, restoring a historical school building and revitalizing an abandoned area. In a small way, this is helping to keep Detroit’s history intact.